As always, click the pics for the bigger version in a pop-up. This pair of socks represents all of the various socks on needles scattered throughout the house. 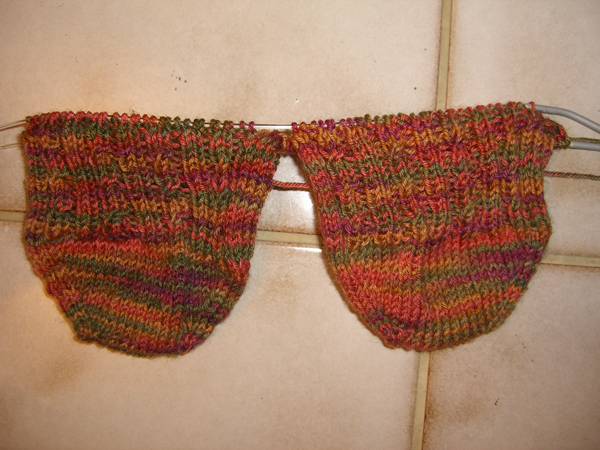 I tend to start socks, and then get distracted. But this pair I’d really like to finish. This is Lorna’s Laces Shepherd Sock in a color called “Gold Hill.” I’m working them on a pair of Inox Gray circs in US#2. I’m making the pattern up as I go along. It’s hard to see in this picture, but the pattern across the instep is basically a 2×2 rib, but every other k2 has a faux cable worked every 4 rows. I think it looks kinda cool in a twisty sort of way. The socks are my current “traveling” project. 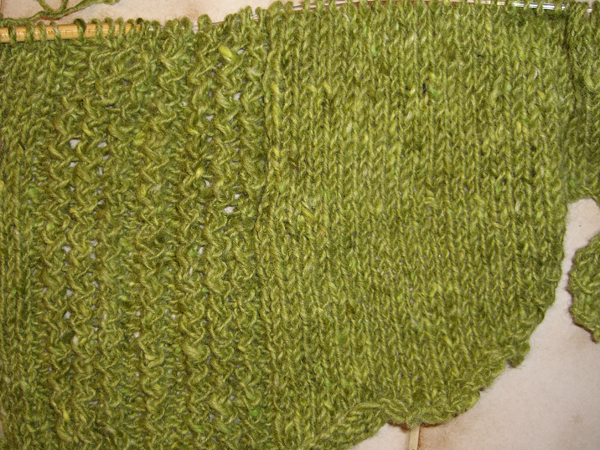 This is the start of the green shirt-styled sweater that has been kicking around in my head for awhile. I’m knitting it of Donegal Tweed on US#10-1/2 needles. Currently I’m working on the body of the sweater. I decided that I wanted my “shirt” to have ruffles down the front. The twisty stitches on the left are supposed to resemble small ruffles. I think it’s fairly successful. I alternate working on this sweater with working on the PNW Shawl. It’s one of my “at home” projects. 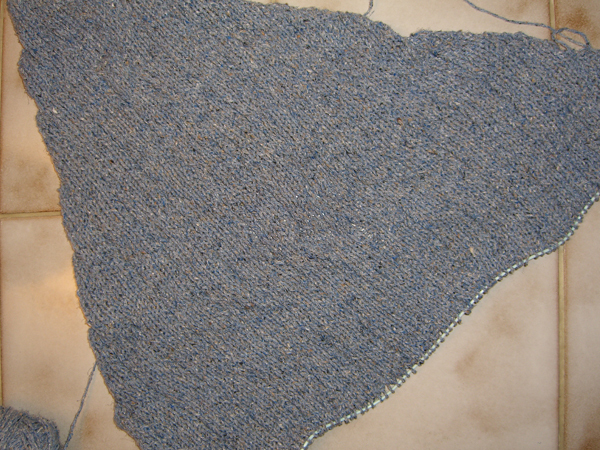 And speaking of the Pacific Northwest Shawl, this is where I’m at right now. I have completed all of the seagulls, and started on the pine trees, which you can just see the tops of at the bottom of the pic. 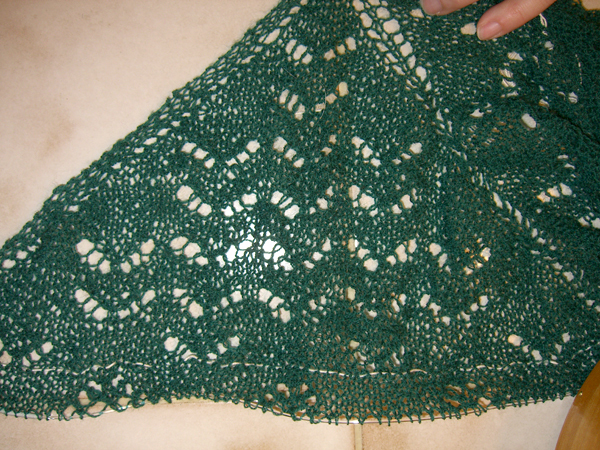 The yarn is a lace-weight wool. The needles are Inox gray — I love the pointiness of these needles for lace, and the smooth joins help, too. You can also see the lifeline that I’ve thoughtfully put in, after ending up having to tink out 1/2 of the seagulls because I totally screwed up the pattern. It was a lot of stitches to tink. I work on the PNW shawl at home, and only when I’m feeling fairly well rested. For me this is definitely not a mindless knit. And, finally, this is Clapotis # 2. The yarn is Silky Tweed in color #13 (Cool Blue). Every now and then I take this project as a “traveling project,” but I haven’t really gotten that far with it considering how long it’s been hanging around. I’ve finished the increase section and I’m on the straight section. I’ve dropped 3 stitches. Perhaps I should make a New Year’s resolution to finish these projects before starting something else. In other news, I finally got around to smooshing a bit of lubrication on the garage door opener’s screw. The garage door actually opens now, without sticking or binding. Go figure. #1 Son will be home tomorrow. I’ve really missed him! I can’t wait to have him back.